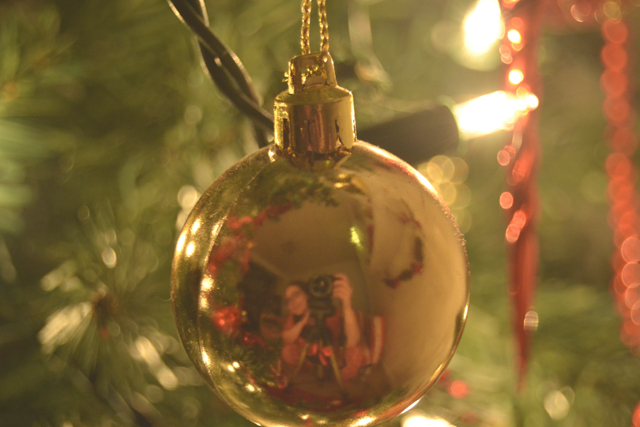 Christmas tree decorating is my thing. I'm a fairly creative person anyway but, for some reason, adorning festive trees seems to be my calling. You know that episode of Friends where everyone decorates the tree really badly, then Monica turns it around and it's perfect? My tree is like that, only I won't let anybody else touch it. For the boring stuff (assembling our artificial tree andh putting the lights on), I "let" Rich do it and shout at him from the sofa when he does it wrong. The actual decorating, however, is my territory. 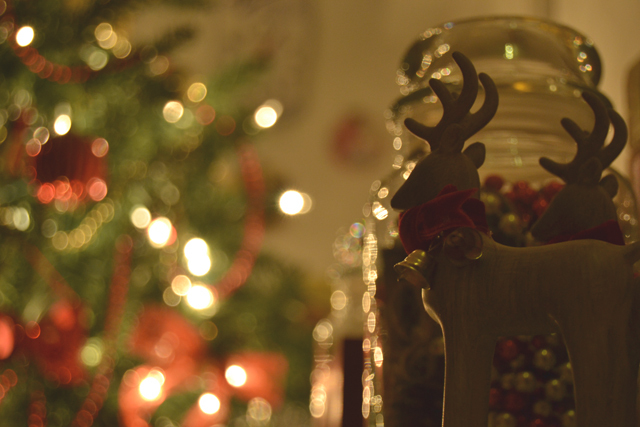 I put my Christmas playlist on, light my Christmas candle and dance away while hanging up my baubles. Perfect! 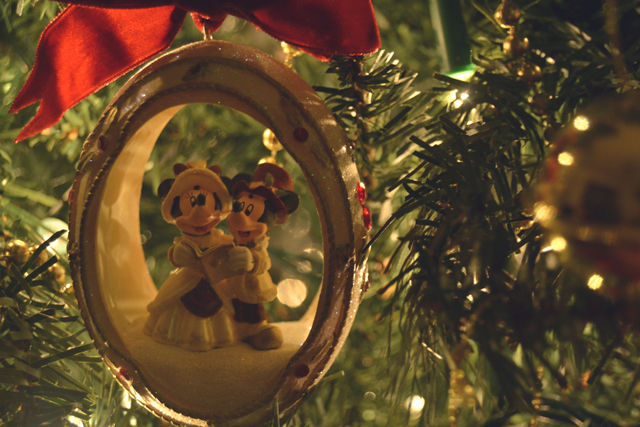 While decorating this year, I had the idea to create a little post on tips for decorating a tree. Of course, everybody has different visions for their tree, but hopefully these are generic enough to apply to anyone. In my case, it's all about being as traditional as possible with red, gold and glitter in abundance. I also adopt a more-is-more policy when it comes to baubles and lights. Honestly, I don't think I'll ever be happier with the meagre (to me) amount I have. We also have an artificial tree as I like the look of a massive, full tree that would be far too expensive to go out and buy each year. I should also warn you now that I take my decorating very, very seriously. No doubt some of you will read this and think my approach takes the fun out of it but this is just the way I like to create my tree! This might be obvious, but decide on a theme and stick to it. As I mentioned above, mine is traditional red and gold. It's very rare that I stray from these colours, although I do have the odd decoration that doesn't quite fit. In this case, I keep within the general traditional theme since they're all green, or red and white. This keeps my tree looking cohesive and purposeful. I've seen some adorable retro pastel decorations this year, but they'd look ridiculous on my tree. Too many ideas or colours going on and you'll end up with a mess. 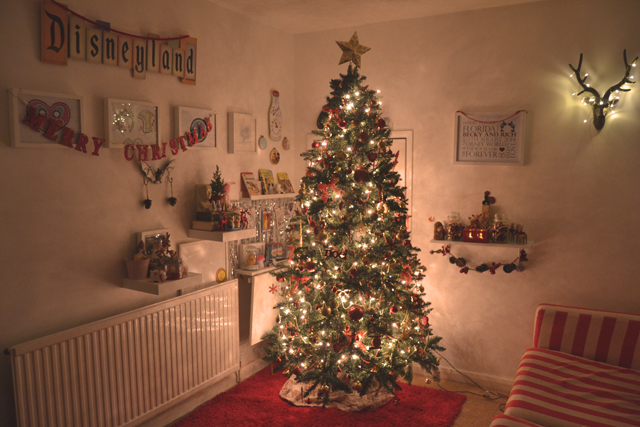 The one thing that will really make or break your tree is going to be the positioning of your decorations. They need to be evenly spaced and well-balanced in terms of size, colour and style. As with most things, getting the foundations strong will make it easier as you go along. 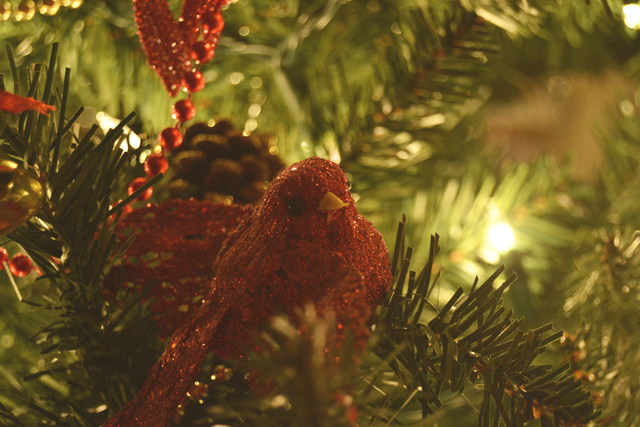 With our artificial tree, we put the lights on before fluffing the branches. This makes the process of stringing lights up so much easier as we don't have to fight with branches hell-bent on poking us. With the lights on, you can clearly see where you've already placed them and avoid getting clumps or sparse patches. As the back of our tree is pressed in the corner, there is no point wrapping lights all the way around so we string them from top down in a zig-zag pattern. After the branches have been fluffed (in all directions, not just to the side), we start draping the beads (no tinsel in this house! ), again from top down in a zig-zag formation, one colour first, all the way from tip to foot of the branches and then repeat the process with the second colour. Before getting out the baubles, we put the star on top of the tree (although I don't actually like the star, so I'm hoping we can buy something different this year). I know this goes against everything you've ever known in terms of Christmas tree decorating but trust me. You know how you put the tree topper on and then all the baubles fall off when you knock them? 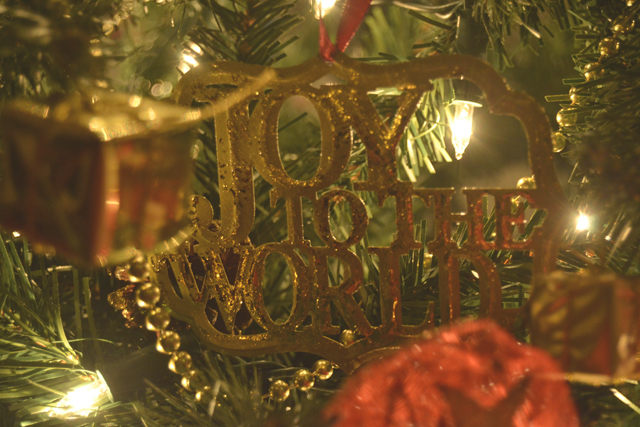 Have you ever knocked the whole tree over when putting the topper on? (I haven't but it does happen!). Better to knock it over before you've spent hours carefully hanging up decorations. Ok, so now you have your tree lit up, fluffed up, beaded/tinselled up and toppered up. Now's the fun part: The actual decorating! While I'm beading up the tree, Rich tends to sort the baubles into both colour and size order (Remember, nobody else is allowed to touch it!). I always start with the biggest decoration and put it roughly in the centre front of my tree. Then I work down from the largest to the smallest, putting up one style at a time. So, for example, I have 10 icicle baubles- 5 gold and 5 red. I'll put all the icicles up, one colour at a time, before moving on to the bell baubles. As I hang them up, I'm very careful to place them in a vaguely symmetrical pattern to avoid ending up with clumps of the same style and colour together. I want to balance my reds and golds carefully, so I try not to have two reds next to each other. The same goes for the style of bauble- I don't want two snowflakes next to each other, even if they're different colours. To avoid this, I'll put a red snowflake top left and then a second red snowflake roughly bottom right. I try not to do this with too much accuracy as I don't want my tree to end up looking too symmetrical. That would just be weird. Once I've put the big, cumbersome decorations up, I can fill in the gaps with the smaller baubles, still ensuring I balance them out colourwise. 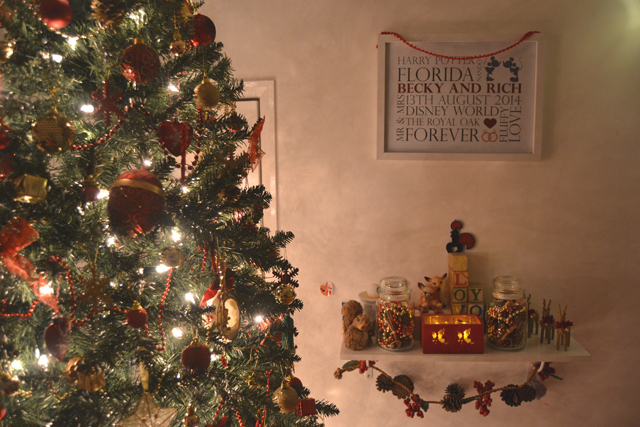 After every single decoration is hung up, I take a step back and give my tree a look over. If the decoration I've just placed on the tree doesn't look right, I move it and step back again. Sometimes I do end up moving the decoration four or five times but, for me, it's worth it. Don't be afraid to move decorations around. 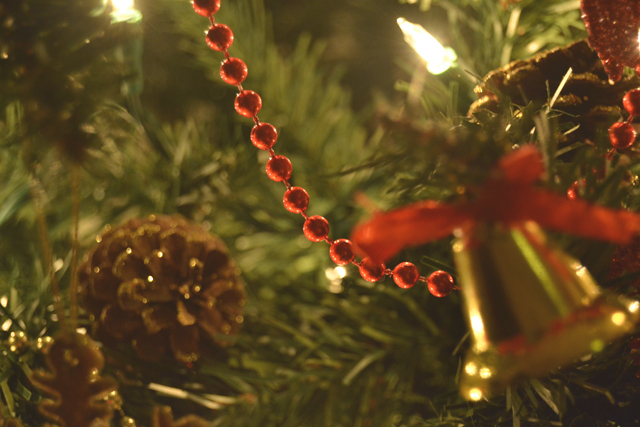 One bauble might be placed perfectly to begin with but later clash with one nearby. If there's no better place for the second bauble, I'll put the first one somewhere else. Think of decorating as a constantly evolving, very fluid process. I have been known to move a bauble days later because it's suddenly looked out of place. Taking that step back to assess your tree can be really beneficial. It's very easy to get caught up in minutae and neglect the big picture, so constantly taking the tree in helps draw the whole look together. By now you'll have realised I'm completely obsessive when it comes to my tree, so it won't come as a shock to say it takes me hours. I'd say on average it takes me around 3 to 4 hours to completely decorate it to a standard I'm happy with. Allow yourself plenty of time, otherwise you'll just end up chucking everything on and saying "that'll do". Having the luxury of a whole day ahead means I'm under no pressure to rush. 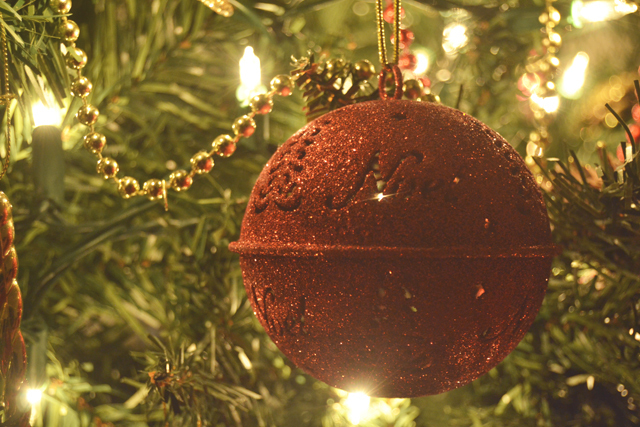 Finally, it's the details that will truly make your tree. 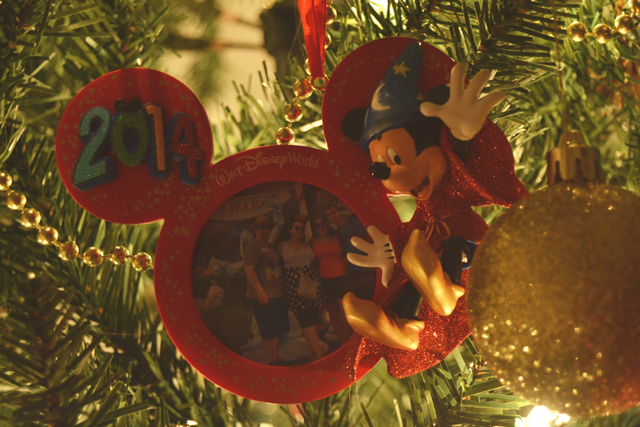 I have a handful of really personal ornaments that have memories attached, such as the one I bought at Walt Disney World this year, complete with a photo from the holiday. 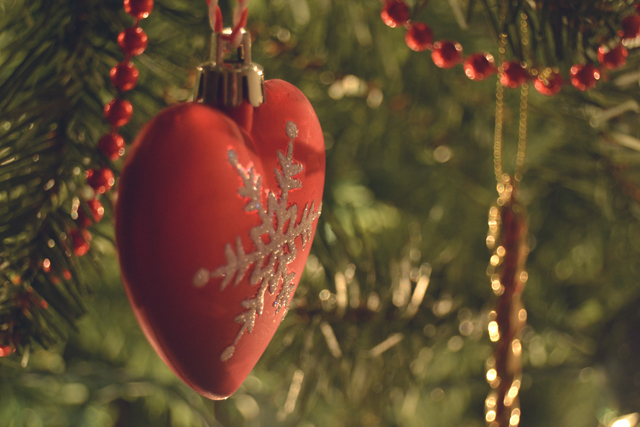 Don't neglect the area around your tree- a tree skirt is much more pleasant to look at than the cold metal stand. 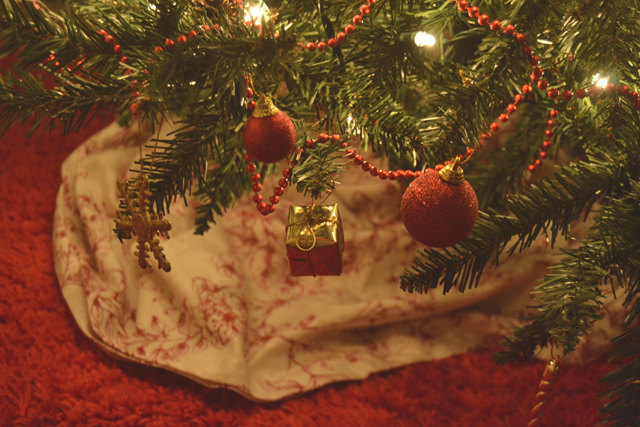 For alternatives to a tree skirt, try popping your tree in a basket or covering the area with some festive fabric. Mine is a tablecloth from Sainsbury's. The end result! As you can see, I don't limit my decorations to the tree alone- Consider the wider aspects of your ropm. 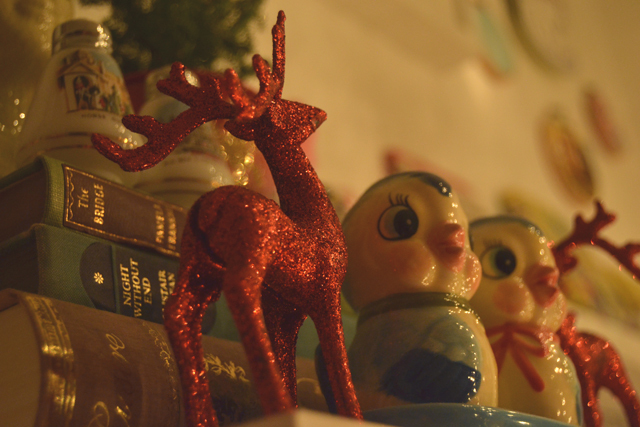 I love the reindeer head so much that it's going to stay up all year round, minus the fairy lights. Obviously, Christmas trees are very personal and not everybody will want a tree that looks as traditional as this. If you want a more rugged look, go for it! Please send me photos of your trees as I love to see them! Haha I dare not send a picture of my tree after that - you'll be appalled! Because the kids like to do ours its a complete mishmash of colours and styles, in great big clumps (based around where they can reach!) - it makes me cringe and smile in equal measure when I see it! It looks beautiful! I love your idea of putting fairy lights on the stag's head; I might have to do the same with mine! I'm really strict when it comes to decorating the tree, too (I'm a perfectionist and I was a visual merchandiser for years, so I think it's just drilled in me). I can't really control how the family tree turns out, so it's usually a mess, but I spend days putting up xmas decs until I'm happy with them. It drives everyone else mad! Ha ha! I just like things done right! I think you'd be appalled if you saw my tree Becky - not only did I put it up really late, it also looks like an explosion in a decoration factory. 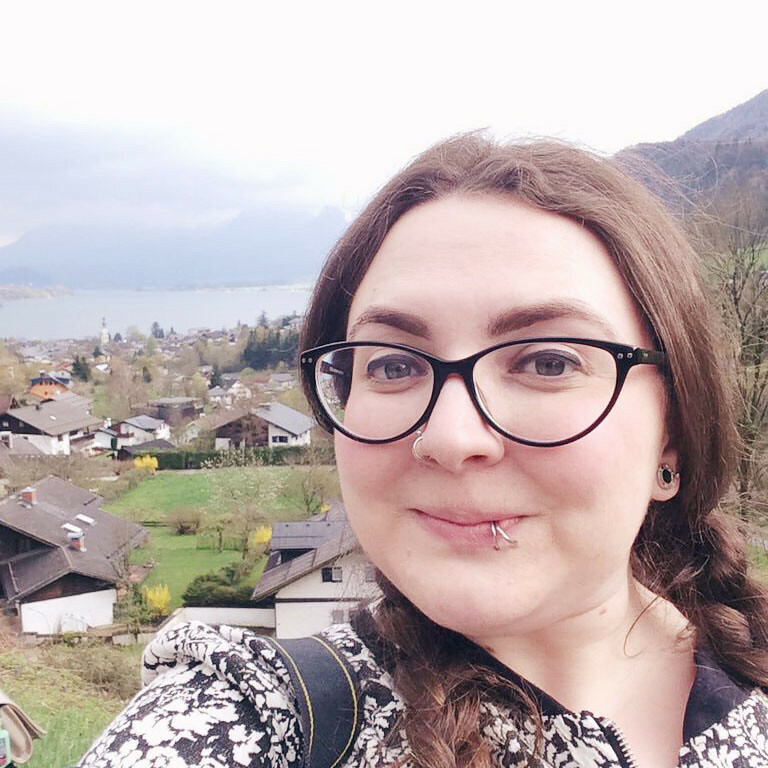 There is no colour scheme and no order to anything (besides not having two baubles the same colour next to each other). But I love it, because it reminds me of my parents' tree, which is 40 years of accumulated stuff that doesn't go together but all has special memories. I buy a new decoration every year too; this year it's a postbox from Macy's as a memory of our honeymoon in New York.